When I work with IT professionals engaged in internal customer service, we often look at ways to define and improve the experience of system users in other departments. In trying to define the barriers to the ideal customer experience for them, I have found this exercise very valuable as it forces people to move away from their usual conversations into new realities seen from the eyes of the customer. I consider this task one of my favorite peer leadership activities as it taps into the power of partnering using guided imagery to achieve this important shift of viewpoint. Draw a boat on a large poster. You’d like the boat to really move fast. Unfortunately, the boat has a few anchors holding it back. 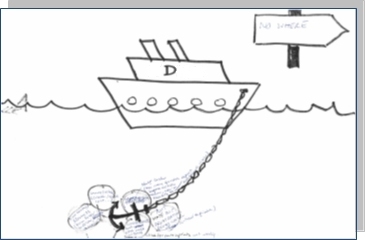 The boat is your system, and the features that your customers don’t like are its anchors. Customers write what they don’t like on a sticky note and place it under the boat as an anchor. They can also estimate how much faster the boat would go if that anchor were cut and add that to the card. Here, estimates of speed are really estimates of pain. When customers are finished posting their anchors, review each one, carefully confirming your understanding of what they want to see changed in the system. I use this activity also for addressing issues in other kinds of teams (beyond IT) and it works beautifully. WHY THE SPEED BOAT ACTIVITY? This activity is an alternative to the cold focus group interview or the likely angry mob you would face if you were to ask your customers in a group conversation what they don’t like about your services. The activity gives you instead a respectful session where people really get into the inquiry, no one gets defensive and hard-to-hear perceptions are still aired freely. I consider this key to identify fresh new ideas for the changes you can make to address your customers’ most important concerns. What difficult conversation about your team’s current level of service could this activity simplify for you and your customers?